“I picture myself as if I was giving a performance. It felt great.” Francisco Alonso said as he threw his arms up in the air to no audience. Are you the next Beethoven, Mozart, or Lang Lang? Or the next Billy Joel? 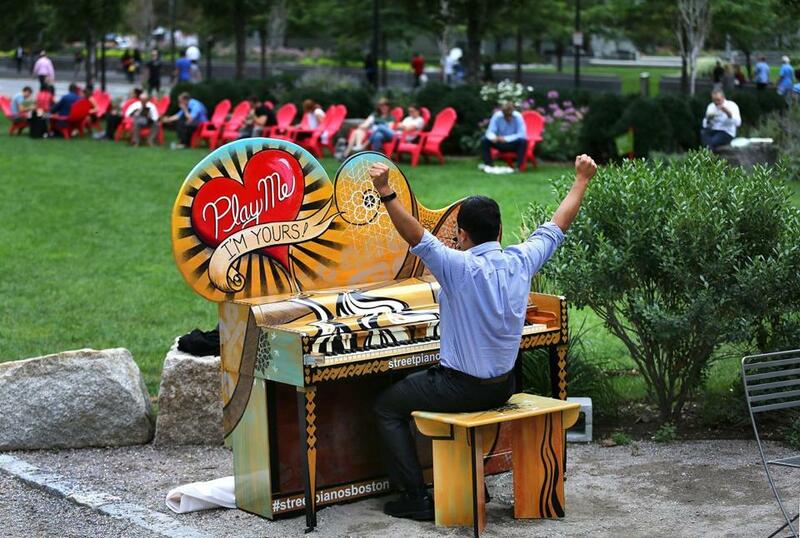 Now you can show off your chops at dozens of pianos scattered through Boston and Cambridge. As of Friday, 60 decorated pianos with the message “Play Me, I’m Yours” painted on them are lining the streets of the two cities until Oct. 10, the Celebrity Series of Boston, which placed the pianos, said in a statement. The Celebrity Series said each piano has been painted by a different local artist. The artists have been working on the installations since July. Each of Boston’s 23 neighborhoods has at least one piano; Cambridge locations included Harvard and Kendall squares, the Celebrity Series said. The Celebrity Series said each piano has a local partner who has agreed to be a “piano buddy,” to report damage and protect it in inclement weather. The “buddy” will also be responsible for locking the keyboard every night. The pianos are part of the popular art installation “Play Me, I’m Yours” from international public artist Luke Jerram that began in 2008, the Celebrity Series said. A similar installation was first produced by the Celebrity Series in 2013. More than 500,000 people engaged with the Street Pianos that year, the organization said. The Celebrity Series said more than 1,500 pianos have now been installed worldwide as part of the installation. Francisco Alonso was playing a piano Friday afternoon on the Greenway in Dewey Square.